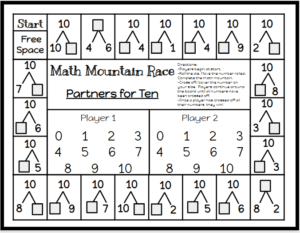 Your students will love to play with the Math Mountain Race game board! The activity is quick to set up with a die and two chips/game markers. 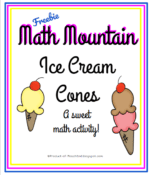 Students must race around the game board completing math mountains until they have covered all their numbers. Two students raced around the math mountain race game board six times before covering all their numbers. 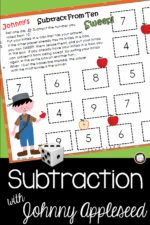 Your students may think it will be a piece of cake to cover all the numbers but they will quickly learn that it isn’t as easy as it may look. Copy the game boards on neon bright paper for added interest. I insert my game boards into dry erase pocket protectors for durability. Students can use a dry erase marker to mark off the numbers they have landed on and answered correctly. When they are ready for a new partner, just wipe it off and start again. Grab your freebie in my TpT store. 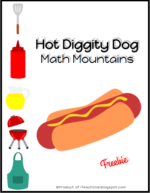 Also be on the look out for the next Math Mountain Race Game Boards. More game boards to follow soon.